Charlie Chaplin died on Christmas Day 1977. To commemorate the 30th anniversary of Chaplins death, Dr. Lisa Stein will devote this years newsletter to the theme of Looking Back, Looking Forward: Charlie Chaplin in the 21st Century. A series of interviews will be conducted with people at the center of the field, including Charlie Chaplin fans. The first interview is with Cecilia Cenciarelli, head of Progetto Chaplin (the Chaplin Project) at the Cineteca di Bologna, Italy. 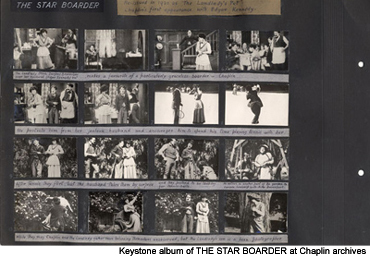 Can you describe the experience a scholar will have in visiting the Biblioteca to use the Chaplin archive database? First of all, anybody with an interest in Chaplin can come visit us. It is true though that the Chaplin Archive Database is a rather specific tool, therefore some basic knowledge is needed as well as a certain familiarity with research and more in particular, OPAC* research. What is the protocol for getting permission to use the database? Visitors are required to make an appointment with our staff, explain their project be it a dissertation, an article or a book. Depending on the requests we receive we might need to forward their letters to the Association Chaplin for approval. To give an example: recently a German judge was researching the Tobis case and since legal proceedings are considered restricted files we consulted the Association first for final approval. Once the researcher arrives here, he/she is provided access to the database and is assisted in his/her research by the Chaplin Project staff. No printing or burning CDs is allowed from the computer post. Researchers, scholars and students alike are usually very positively surprised by the variety of material they find and overall I believe theyre all quite satisfied with their visits. What sort of projects have been accepted in the past? Can you give me some examples? What sort of projects might be unacceptable? Cinema students exploring the history of filmmaking in different times in history (organization of the work, writing and editing methods etc. ), others interested in the passage between silent and sound cinema; communication students writing about the rediscovery of archival experience through technology, Chaplin scholars consulting the database for a particular period in his career (e.g. the Keystone-Essanay-Mutual era) a particular film or moment in a film (the final sequence in City Lights, the speech in The Great Dictator) or technique (recording of music), the relationship between Chaplin and the 1940 censorship etc. Any project where use of the material out of context might result in something defamatory against Chaplin or his family is not considered acceptable as well as any other project which the Chaplin Association/Roy Export Company Est. as sole proprietor of these materials decides not authorize. What resources does the archive offer? The archive follows Chaplins life and art – and by direct reflection the history of cinema and the history of the world – for almost a century. It includes production and post-production materials (shooting and daily production reports, cutting scripts, screenplays and annotated drafts of screenplays, scenarios, preparatory notes, storyboards, sketches, costume scripts etc. ), promotion materials (exhibitor books, lobby cards, programs), shorts stories, business and private correspondence, press clippings, interviews, censorship papers, legal proceedings and more. When Progetto Chaplin officially ends in 2007, what will happen? Will scholars still be allowed to visit the Biblioteca and use the database? Will the procedure still be the same? At some point, will scholars be able to request a password and search the database from a remote location? When the Chaplin Project ends at the end of 2007 the procedure will basically remain the same. The Chaplin Research Centre will be officially inaugurated and we hope to welcome even a higher number of visitors every year. The Association Chaplin will decide whether to authorize different ways of accessing the database but no remote access to all the documents has been considered so far, the general idea being that if you need to search Chaplins Archive, Bologna is the place to go (and if I might add, not a terrible place to spend a week! Cliché but [therefore] true: excellent food, nice weather, bicycles, lots of theatres and cinemas, some interesting museums, and the oldest university in the world). Our purpose is to improve the knowledge on Chaplin and keep a high interest on his art and genius for future generations as well as to promote his films through events, retrospectives and publications. 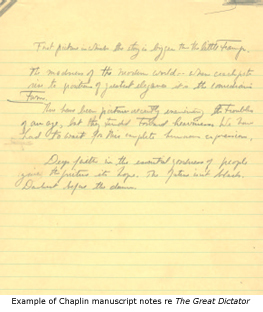 Considering the content of the archive, there is certainly room for discovery! Can you discuss what the Cineteca is planning for the Chaplin retrospective this year? 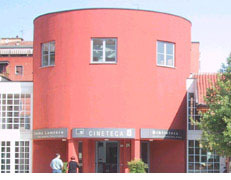 Cineteca di Bologna, like many other institutions in the world will in 2007 pay a tribute to Charlie Chaplin for the 30th anniversary of his death. For us this date also coincides with the end of our project and with the desire to share our work with the largest and most diversified audience possible. Besides hosting, starting from the end of May, the monumental Chaplin in Pictures exhibit which opened in Paris in 2005 and has since then successfully toured Europe, we are going to show if not all, the great majority of Chaplins films from 1914 through 1967. The retrospective will probably start around the first weeks of June with several screenings accompanied by Chaplins restored scores played live by the Bologna Opera House orchestra, and will carry on during Il Cinema Ritrovato restoration festival (June 30th  July 7th) with more live events, brand new Keystone restorations, other silent and sound films and early Mutual and Essanay short-films. Updated information on the program will be provided soon on our web-site – Chapliniana: Chaplin in Bologna. Check out the other interviews!